Recently a woman named Shelly took in two nine-week old feral kittens. One of them was deformed. Cassidy had no back paws and one leg was shorter than the other. Yet somehow he managed to survive along with his brother Topper in the forest without any assistance. Their luck was about to change. Feral cats are fearful of humans, regarding them as dangerous predators. Still, it look less than a week of devoted care to persuade these frightened kittens that humans can also love. Plentiful food, warmth, massages and coos soon had these boys demanding playtime and petting. Cassidy has been seen dragging himself to the door and mewing for Shelly after she leaves. 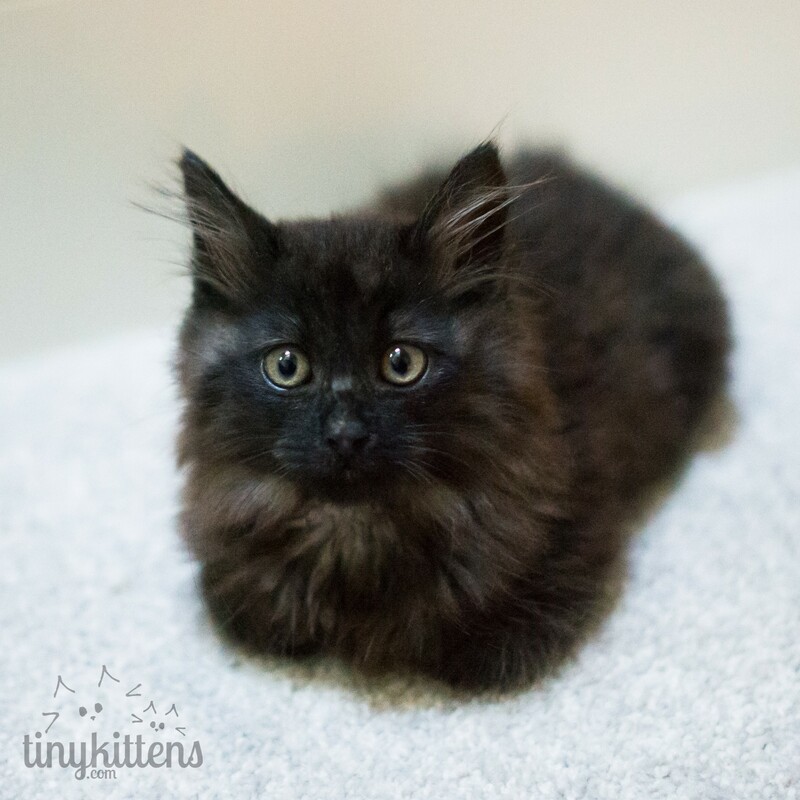 The saga of these kittens can be viewed online via the Tinykittens live kitten cam and we viewers (over 1300 of us) lost our hearts in an instant to the kitten with no back feet and his fluffy and feisty brother. A few days into his stay it was plain that Cassidy was in trouble. Finding him listless, Shelly took him to the emergency room veterinarian. Although the cost of such care is high ($1000 or more), she did not hesitate. She trusted that somehow the need would be met. Cassidy was diagnosed with an infection in his back stumps. That infection caused pain and difficulty in urinating. He was given a catheter for fluids and an IV of antibiotics, and spent the night at the facility. The veterinarian suggested that it would be in Cassidy’s best interests to be euthanized but Shelly would not have it. Through her tears she explained her passion in doing all she could for this little creature with the fighting spirit; she wasn’t sure the vet understood but the decision was respected. The vet has since followed up on Cassidy’s progress, offering support. The next day Shelly’s regular veterinarian, Dr. Ferguson took over care of Cassidy. She theorized that his deformity was not congenital but the result of some catastrophe. Shelly suggested that the umbilical cord may have been wrapped around his feet at birth and in her efforts to bite off the cord, the mother bit off his feet. 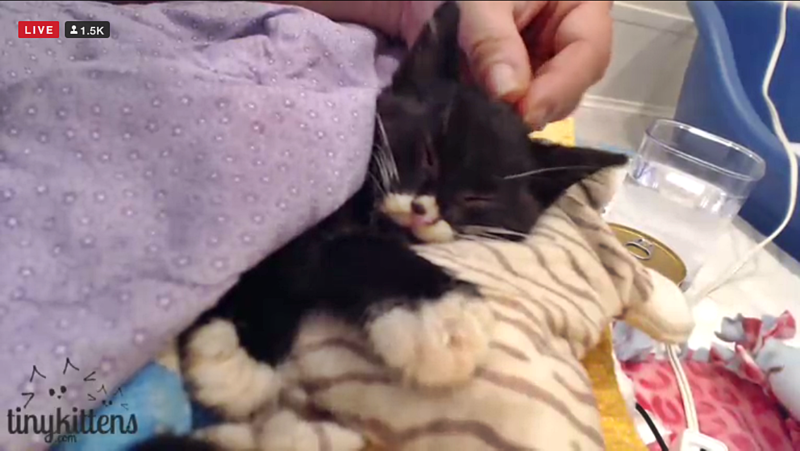 After staying with Dr. Ferguson during the day, Cassidy came home to be nursed by Shelly. We watched in wonder as she took care of his every need, including helping him to urinate and empty his bowels. She fed him by hand, administered his medications, wrapped him in a soft blanket, massaged his head, and gave him a special plush toy cat dubbed “Frank” with simulated heartbeat and inner heating pad to lie upon. Likely there would be no sleep for Shelly again that night. Topper would also nurse by grooming Cassidy’s head. It was hard to hold back tears watching this little creature care for his brother. Returning to Dr. Ferguson in the morning, Cassidy remained at the facility for the day; we waited anxiously for an update. The happy news came that Cassidy, despite casts on both stumps, had managed to get himself to the litter box where he urinated on his own. That’s when we knew he had turned the corner and was on his way to recovery. That recovery will require a long and difficult road. The infection still remains several days later and antibiotics will continued to be administered. Eventually Cassidy will need surgery on his stumps as there are exposed bones. His fierce will to live is tested on a daily basis but thanks to Shelly’s tireless nursing, he is winning the fight. She believes he has earned the right to live despite the difficulties. He will not give up and neither will she. I am addicted to this story. I can’t stop watching this cam, checking in with Facebook for updates, and collecting screen shots of Cassidy and Topper as mememtos. I have an email friend watching with me and we exchange emails daily on his progress. Far from alone in my “addiction” there are still over a thousand viewers daily. They watch as I do because this kitten cam is life affirming. 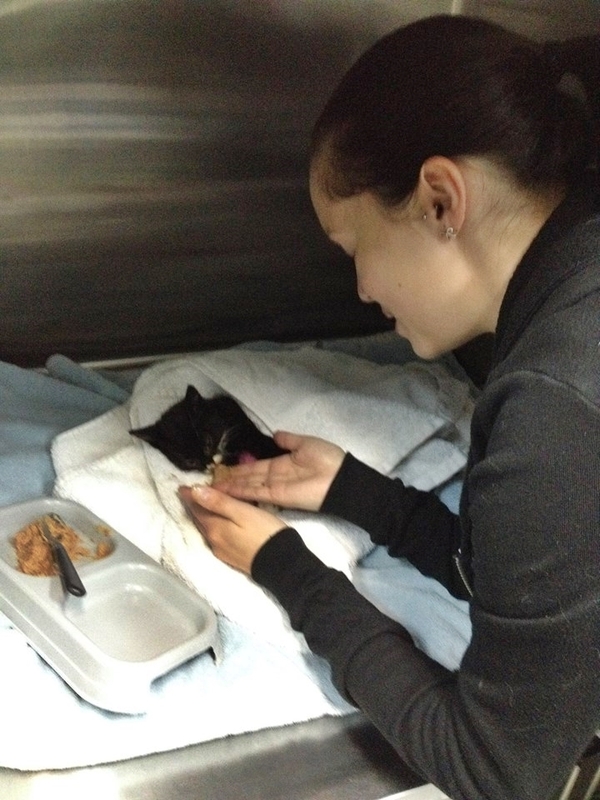 Life-affirming as we witness the tender care of kittens in need like Cassidy. Life-affirming as viewers contribute financially (the emergency room visit was covered in less than twenty-four hours by two of Shelly’s friends) and offer moral support and helpful suggestions to Shelly on how to deal with Cassidy’s needs. 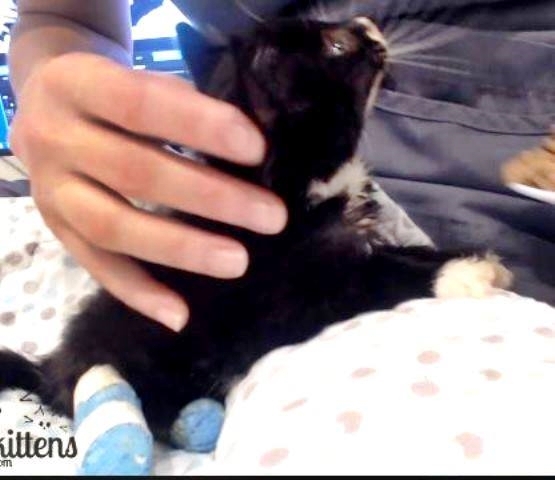 One viewer was able to connect Shelly with the owner of Anakin, a cat with two legs who has thrived despite his challenges. And life-affirming in demonstrating the power of love to overcome any obstacle. Love compels Shelly to care for Cassidy despite the difficulties of the job. Knowing the commitment is long term she continues each day to administer medications, clean him after he urinates or has a bowel movement, feed him, talk to him and cuddle him in her lap. The costs are high in the amount of work, lack of sleep, endless worry and the emotional roller coaster of caring for such a sick creature. Not unlike mothers with newborn babies or adult children caring for elderly parents. Through all the hard physical and emotional work a bond is forged and reinforced through such loving sacrifice. The perks, however, are sweet. Cassidy, once a feral who feared humans, now drags himself to Shelly and taps her on the knee, asking to be taken into her lap. Turning his face towards her, that loving gaze is unmistakable. 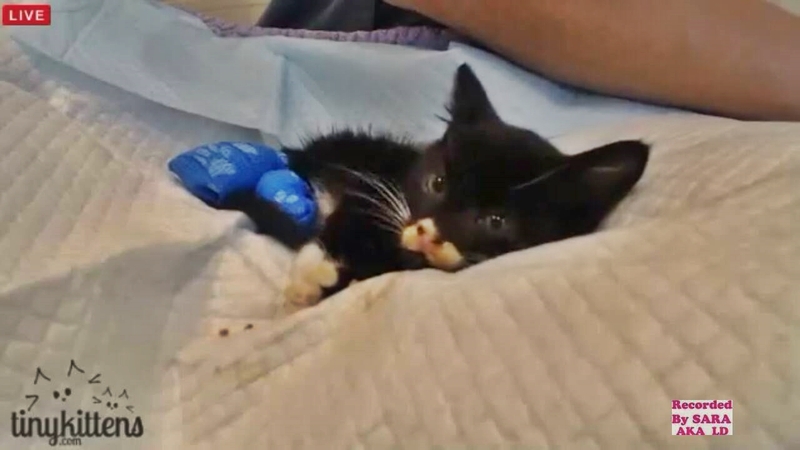 How this kitten survived in the wild for nine weeks is beyond comprehension. Most other kittens would have died long ago. It was a miracle that the mother cat did not abandon her baby as is common with newborn kittens near death. It was discovered through x-rays that he had eaten anything and everything in order to survive. He was literally a day or two away from death before he was rescued with Topper. I believe that signs from Our Creator are all around us, waiting to be discovered. Cassidy was spared for a reason. And the lessons of his extraordinary life are just beginning to unfold. Lessons on the power of love to overcome any obstacle. Lessons of a community inspired by the love of one person for another to give of themselves as a result. Lessons that translate from the care of kittens to the care of each other. We are surrounded by death and hopelessness in our world. Endless wars. Shootings and crime on our streets. Famine, poverty and disease. Abortion and euthanasia. Hapless leaders, obsessed with their own power are blinded to solutions for these problems and the people they are supposed to serve lose confidence and hope. The strong continue to survive while the most vulnerable are discarded, neglected and unloved. Children, abused and abandoned by their parents. The elderly, forgotten and alone in some nursing facility. The mentally challenged, homeless and alone as they fight to survive. In the midst of all the misery in the world, there are people who know how to love. Theirs is a sacrificial love that saves one life and then causes it to thrive. And they do it over and over again. We learn from such people and now we need to let those around us know of and learn them. Inspiration and even transformation come from witnessing those who nurse the sick, feed the hungry and pour out their hearts without thought to the cost. People loving people, people loving God’s creatures—all of these make the best teachers. All creatures, great and small, man and beast, fight to live as Cassidy does. We need more Shellys, Dawns and Dr. Fergusons who dare to reach out and take in the most vulnerable. Who are willing to endure the sleepness nights in worry even as they administer medications and feed a poor soul who can’t feed himself but is hungry nonetheless. Who perform the most distasteful tasks of carrying for bodily needs because their love compels them. Who dare to push back against the experts to advocate for the one they love. Who give their hearts away even though their efforts might not be successful. Shelly said it. Cassidy deserves to live because he has fought so hard for life. Who is the Cassidy in our world and what can we do to help? Who is the Cassidy that we can love? Copyright 2015 Susan W. Bailey. Photos provided from the Tinykittens and Tinykittens Cat Pack Facebook pages. Videos are from LIl Darlings and DataPrincess on YouTube. 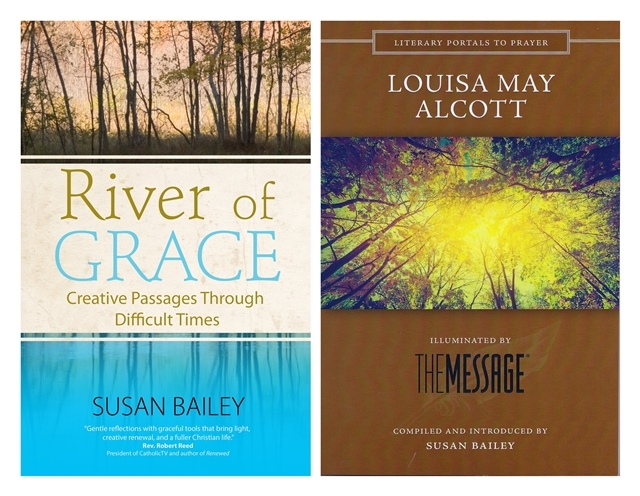 Next Announcing a musical soundtrack to my upcoming book, “River of Grace”! I have also been following Cassidy and Topper. I love what you have written here. Your writing always touches my heart and inspires me Susan. My heart goes out to precious little Cassiidy and grateful that Topper is there to keep him company. My prayers are with them every time Ii think of them and as I watch them. Shelly is truly an angel with the care and love she gives to him as she has given to so many cats and kittens over the years. — It wasn’t the first night that he became listless, They were brought in on Saturday evening; he didn’t start showing issues like dragging his hind end until Monday morning. — He had an IV catheter for fluids, not a urinary catheter. Thanks so much for this, it’s hard to catch everything on the chat, it goes by so fast! I’ll make these corrections to my post. Beautiful article, and so true. Lovely writing as usual, Susan. I hope Shelly and all Cassidy’s other advocates and supporters get to read it. Like you, I am addicted to watching Cassidy and Topper. It is an inspiring story and I root for progress every day. Many thanks to Shelly and all the many fosters and caregivers the world over who help the helpless and provide hope to the hopeless. Me too! So wonderful to know there are people like Shelly in the world. This is a beautiful article and brought tears to my and several friends’ eyes. Thanks so much. Hope you were watching this afternoon as Cassidy took many giant steps up the steps in Shelly’s house, all the way to the second floor. Thanks again for the wonderful article. Oh yes I did, it was amazing! And now a company is making him a wheelchair. This is one committed, tenacious community! Thought I’d share one of my passions with you…. Tinykittens.com and their mission to make a difference! Cool, thanks! I love TinyKittens!